The Great British Bee Count was set up by Friends of the Earth in order to monitor the British Bee population as the number of British bees are declining! Twenty species of Bee have already been lost in the UK and this number will increase if action is not taken soon. Our Bees are in trouble! British bees are threatened by many factors induced by the human population. These include; habitat loss and destruction, changes in land use (increasing urbanisation), toxic neonicotinoid pesticides and climate change. Bees are an essential component in helping to sustain our food and economy as we rely on them to pollinate around 75% of our fruit and vegetable crops. 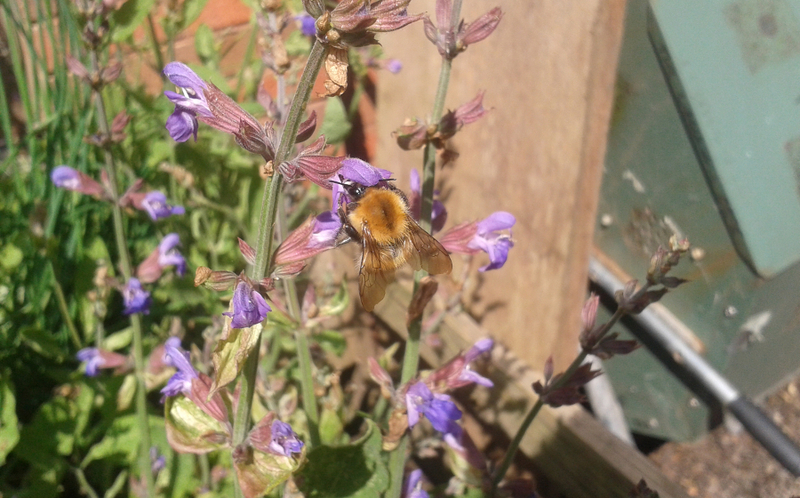 Digbeth Community Garden is in full bloom, showcasing a rich wild flower habitat for bees and other wildlife to thrive. We have already spotted different species of bee and have taken lots of photos. Check out a twitter page to see what we have spotted! Honey bees fly at a speed of around 25km per hour and beat their wings 200 times per second! Be sure to follow us on twitter (@Bham_FOE) and see the good work we are doing for British Bees! Hi Hayley thanks for sharing, i’m glad that you guys are doing something about this – keep up the good work!